The YINI Symposium was held in Madrid on the 25 October 2018 as part of the IV World Congress of Public Health and Nutrition (Nutrimad 2018). This scientific symposium gathered together renowned nutrition scientists to discuss the role of yogurt in relation to healthy eating in children. We live in an obesogenic environment, and high-energy nutrient-poor diets exacerbate the risks of cardio-metabolic diseases such as Type 2 diabetes, dyslipidemia, cardiovascular disease and metabolic syndrome. Indeed, poor diet has now surpassed tobacco use as a main risk factor for cardiovascular disease in many countries. Diet-related diseases are largely preventable and manageable and many lifestyle habits are learned in childhood. In this stimulating presentation, Dr André Marette, Professor of Medicine, Laval University, introduced the need for effective interventions that help to address unhealthy diets and behaviours in childhood, and stressed that governments need to ensure children have access to safe and nutritious foods. He then went on to explain that long term dairy consumption is associated with essential nutrients for adequate growth, development and maintenance of a healthy dietary pattern, and prevention of cardio-metabolic diseases. Proper nutrition at these key times promotes health in adulthood. A growing body of evidence further suggests that yogurt consumption is associated with lower body weight gain and reduced risk of type 2 diabetes in adults. 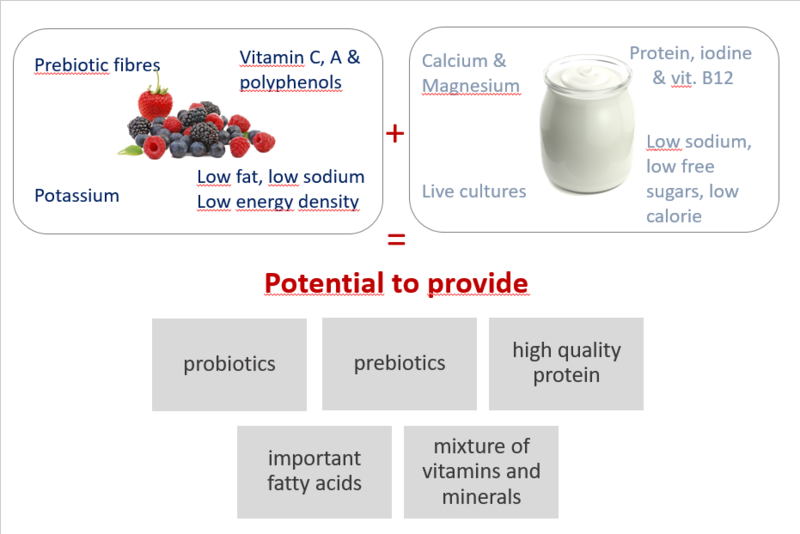 As a nutrient-rich fermented dairy food, yogurt contains live bacteria and the bioactive bi-products of fermentation are thought to provide additional health benefits, such as favouring a healthy gut microbiota. Marette made a point of highlighting that epidemiological studies make no distinction between sweetened, artificially-sweetened and unsweetened yoghurt, but consistently show favourable associations, despite the presence of added sugars. In addition to its nutrient density and bioactive components, the beauty of yogurt is that it can be a vehicle for healthy eating; data from the Framingham Heart Study Offspring indicated that diet quality might be higher in yogurt consumers . As well as the data showing that the DGAI score tended to be greater in yogurt consumers compared to non-consumers, fibre intake was significantly greater in yogurt consumers in whom yogurt consumption made up 2% of total energy intake. Yogurt can increase the consumption of fruits. Marette argued that, on this basis, yogurt can increase the consumption of fruits. 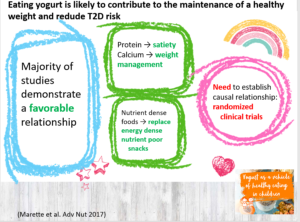 Yogurt consumption has been associated with reduced weight gain and lower incidence of type 2 diabetes, whereas fruits have established effects on reducing the risk for cardiovascular disease. So, eaten together they may exert combined benefits through potential prebiotic and probiotic effects. 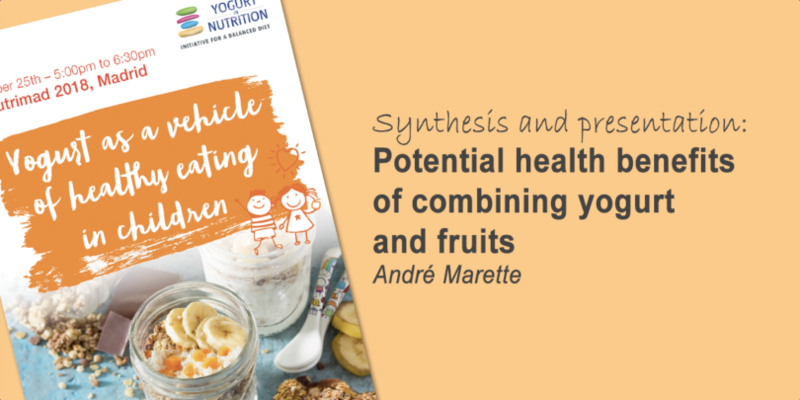 Marette concludes that in light of the positive cardiometabolic impacts of fruit and yogurt and their association to healthy dietary patterns, there is sufficient evidence to warrant further exploration into the potential synergistic health benefits of combined intakes of fruit and yogurt. An integral part of dietetic advice is to find appropriate and sustainable ways to help people improve eating behaviours. The dietitian’s toolkit will invariably include the encouragement of yogurt, as well as fruits. The key is to ensure that nutrient needs are met, as well as providing tasty meals and snacks that are in line with a patient’s individual dietary requirements. Treating and managing obesity, diabetes or cardio-vascular conditions typically requires calorie reduction whilst including nutrient dense foods that meet dietary recommendations for health. Substituting high energy, nutrient deficient snacks with fruit and yogurt could reduce intakes of high calorie obesogenic foods. The yogurt / fruit combo lends itself well to this, and can be applied in many tasty ways.